In this blog post, I'm going to be stress testing the carbon processes. This involves publishing a great deal of metrics in a very short amount of time. The carbon-cache configuration limits the number of Whisper file creations per minute. Open the configuration file and change this configuration setting. # Softly limits the number of whisper files that get created each minute. # database files to all get created and thus longer until the data becomes usable. # the files quickly but at the risk of slowing I/O down considerably for a while. Since we are about to publish a bunch of metrics, let's modify this part of the configuration and set the value to 10,000. NOTE: You need to restart your carbon cache process for these changes to take effect. 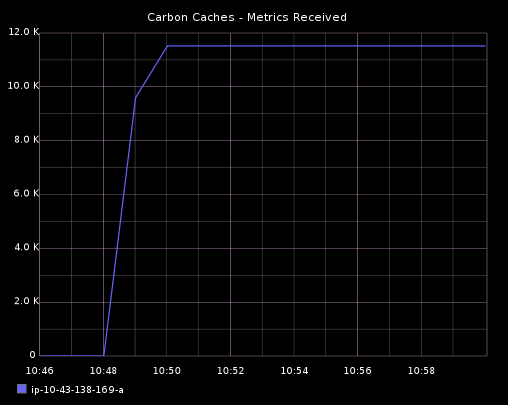 I have a Stresser application that will publish a fixed amount of metrics to the carbon-cache regularly. It uses the Coda Hale metrics library internally and more specifically, it uses a Timer object to collect data. Using the command line above, with 128 timers specified, the number of distinct metrics published to the carbon-cache will be 1920 (128 * 15). Open the dashboard that we built as part of the previous blog post. You will be able to see details about the number of create operations performed by the carbon cache. I started the Stresser before the MAX_CREATES_PER_MINUTE configuration change was made. While it was running, I made the configuration change and restarted the carbon-cache process. The dashboard graph for create operations shows what happened. A few create operations were performed at a rate of 10 per minute before the configuration change. After the restart, close to 1800 create operations occurred during one minute because the threshold was set to a high value of 10,000. You can also test the behavior by spinning up the carbon cache with the creates threshold set to 10,000 and then kick off the Stresser. You would see all 1920 metrics created during the same minute. Finally, the total number of metrics published every 10 seconds is 1920. Carbon process metrics are reported every 60 seconds. Therefore, the total number of metrics received by the carbon cache every minute would be 11,520 (1920 * 6). Now that we have a way to publish metrics to the carbon cache and visualize it's behavior, we can push it to the limit. As the metrics are getting published, run the iostat command to measure the I/O performance as the carbon cache is reading from and writing to the disk. We can now increase the number of metrics that are reported by the Stresser and see how it affects I/O performance. It is also important to note that there isn't much CPU activity at this point. CPU usage and memory usage increased slightly. Notice that the cache sizes and cache queues also started to grow after the metric publishing rate was bumped. Compared to the previous test, memory consumption increased from 500MB to 900 MB and the CPU activity increased slightly. If you stare at the htop output, you'll see a spike every 10 seconds (the metric publishing rate) for one of the cores. It took a good 30 minutes for the carbon cache to create all of the new metrics. Compared to the previous test, there is some more memory usage and CPU utilization. However, the I/O performance had the biggest impact with the await column reporting much larger values and the % utilization showing 100% at multiple points. 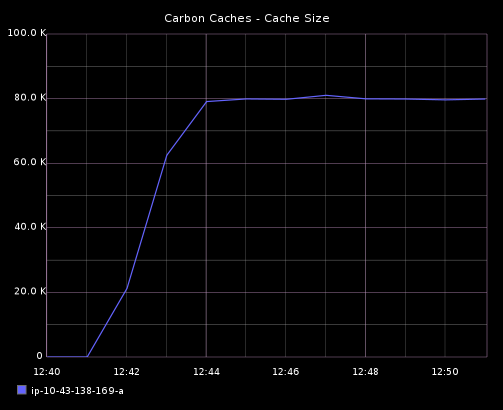 The cache queues were high but remained constant and the cache size incremented until all metrics had been created. Afterwards it flat-lined at around 1.5M. Let's also say that each of the 60,000 different metrics has a single data point every minute. Since a metric is represented as a single Whisper file in the filesystem, Carbon would need to perform 60,000 write operations every minute - one for each Whisper file. To handle this rate of metric publishing, Carbon would need to write to one file in less than one millisecond. At this day in age, this is not a problem. However, if the metric publishing rate increases to very high levels - like in our scenario with 700K metrics published every minute - the rate of incoming data points exceeds the rate at which they can be written to disk. This can also happen if the disks in the Graphite server aren't SSDs and have lower speeds. With hundreds of thousands of Whisper files to be written to frequently with ~12 or so bytes of data each, the disks are most definitely going to spend most of their time performing seeks. Let's assume that the write rate for disks isn't huge and that it can't be increased substantially, even if we buy the fastest SSDs out there. The only way to make writes faster would be to do less of them, and we can do less of them if we buffer multiple related data points and write them to their corresponding Whisper file using a single write operation. Whisper arranges consecutive data points contiguously on disk. Chris Davis decided to modify Whisper and add the update_many function. It takes a list of data points for a single metric and compacts contiguous data points into a single write operation. Even though this makes the write larger, the difference in time it takes to write ten data points (~120 bytes) versus one data point (~12 bytes) is negligible. It would take quite a few more datapoints before the size of each write starts to noticeably affect the latency. To be able to use the update_many function in Whisper, a buffering mechanism was implemented in Carbon. Each incoming data point gets mapped to a queue based on its metric name and is then appended to that queue - by the Receiver thread. Another thread - the Writer thread - repeatedly iterates through all of the queues and for each one it pulls all of the data points out and writes them to the appropriate Whisper file using the update_many function. If the rate of incoming data points exceeds the rate of write operations, queues will end up holding more data points. The only resource this costs the server is memory and it's acceptable because each data point is only a few bytes. A nice advantage of this approach is that it adds a degree of resiliency to handle temporary I/O slowdowns. If the system needs to do other I/O not related to Graphite, then it is likely that the rate of write operations will decrease. If this happens the Carbon queues will simply grow. The larger the queues, the larger the writes. Since the overall throughput of data points is equal to the rate of write operations times the average size of each write, Carbon should be able to keep up as long as there is enough memory for the queues. If Carbon maintains queues of data points in memory waiting to be written to disk, it means that those data points will not show up in your graphite-webapp graphs, right? Wrong! A socket listener was added to Carbon that provides a query interface for accessing the buffered data points. The graphite-webapp makes use of this query interface each time it needs to retrieve data. The graphite-webapp then combines the data points it retrieves from Carbon with the data points it retrieved from the Whisper files on disk. Therefore, your graphite-webapp graphs will be real-time! In general, data points are instantly accessible once they are received by Carbon.